This week, Carmi’s Thematic Photographic prompt is “retro”. Kraft Macaroni & Cheese is my ultimate go to comfort food! I think I had it for the first time in the latter part of the 1970s…that and Life Cereal are two of my favorite foods from then. Here it is, 2012 and Kraft Mac & Cheese is still going strong and has a new generation of fans. It’ll always remind me of my high school days…wonder if it’ll remind this young’un of his childhood? That looks SO GOOD, I may have to scrap tonight’s dinner plans and make that instead! It is definitely comfort food. My son eats it still! Love those eyes – great shot! ..and still is at our house! Yummy! The neighbor girl used to sing “You are my mac and cheese, my only mac and cheese . . .” when I made it! Macaroni cheese is a favourite of my daughter when made by my wife. Adorable picture, caught a great look on his face. And Mac & Cheese has been the ultimate comfort food for many a decade now. LOL makes me think of those old “Mikey likes it” commercials. I vote yes, it will. Food has an amazing ability to bring us back to a specific time of our lives. Sometimes, I’ll have soup on a cold winter’s day and I’ll be taken right back to having something similar in my mom’s kitchen. I can almost feel what it was like to be back there – all because of a hot bowl of soup. 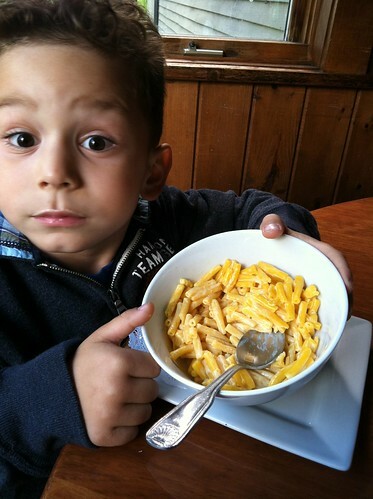 Mac and cheese is totally timeless, too…love this shot!